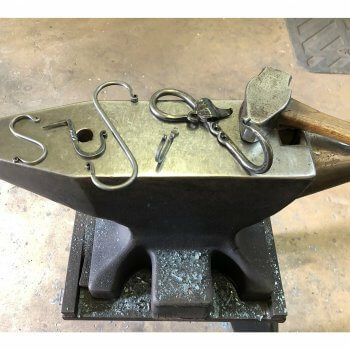 In this workshop learn the fundamentals of blacksmithing from the tools and process to finished piece. Work with a forge and practice basic skills, such as drawing out a point on an iron bar, twisting, and punching. You will complete several simple projects such as drive in hooks, s-hooks and tab hooks. We will also talk about design and function of ironwork, and if time permits, you can explore decorative forging, including flowers and leaves as design elements. Nick Vincent has been a full time smith for 28 years. His career began as from his interest in colonial reproduction ironwork. His early career focused on reproduction hardware and decorations for old houses and museums and collectors. As styles changed, he shifted into more artistic and functional work incorporating organic decoration into the traditional forms. Nick has worked with smiths across the country including Colonial Williamsburg.